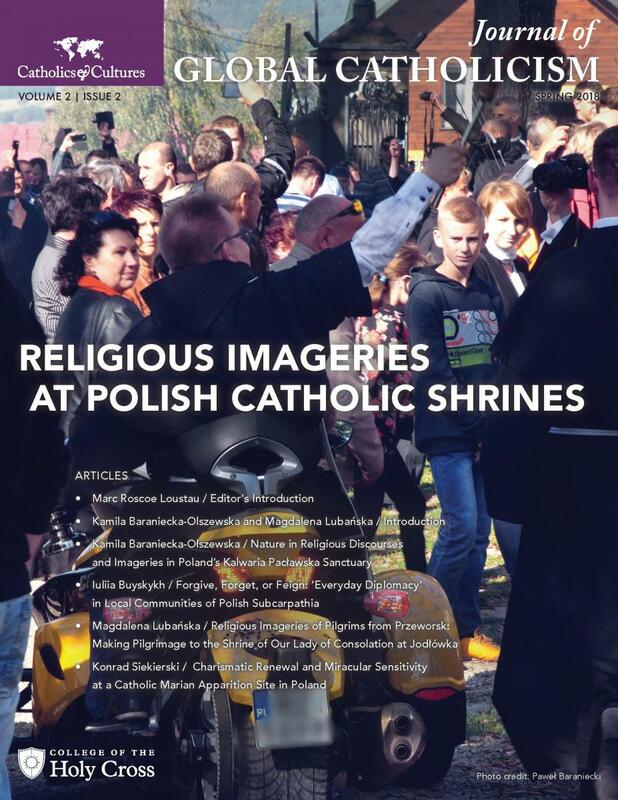 The Spring 2018 issue of the Journal of Global Catholicism, a publication of Catholics & Cultures and the College of the Holy Cross, highlights the experience of pilgrims to Polish Catholic shrines. The articles present the findings of a multi-year research project entitled, "Multisensory Religious Imageries in Selected Catholic Shrines in South-Eastern Poland," conducted by a team of four researchers in Poland and financed by a grant from the Polish National Science Centre. The project aimed to develop an anthropological account and analysis of the embodiment of religious imageries embraced by modern-day Catholic pilgrims who come to worship in shrines located in the region of Subcarpathia (Polish: Podkarpacie), and — in particular, how religious elites moderate such practices in a top-down fashion and how pilgrims influence the specific nature of those practices from the bottom up. At a Marian apparition site in Mazury, Konrad Siekierski considers how the growing Charismatic Catholic Renewal movement is reshaping Catholics’ embodied sensitivity to the miraculous. Read the Journal at www.catholicsandcultures.org/journal.